A war. A battle. 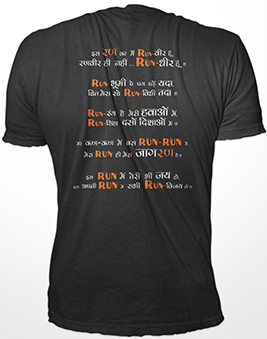 That's what running is ... ! It's about perseverence ... it's about that last drop of energy ... it's about the persistent struggle ... the dedication ... complete devotion ...! It's about the fight within ... and as much about valour as much it is about glory! And that's when the essence of this tshirt dawned upon us! Our designers worked for weeks to bring the fearsome expression on the dashing "RunVeer", and we spent enjoyable poetic sessions while conjuring the wondeful poem on the back! We could say much more about the aesthetics ... but we'll let the pictures talk to you ... and we'll let you judge for yourself!